Look for the bare necessities, the simple bare necessities. 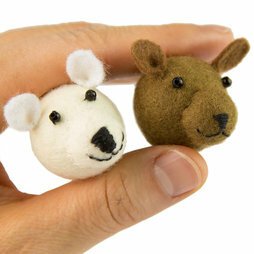 Forget about your worries and your strife... Balu from the jungle and his friend from the Arctic are carefully handmade in Switzerland and of wool felt and sewed-on Rocailles beads. 1 pc. 13,01 EUR ea. In order for the bear to hold every note securely, a strong neodymium magnet is glued into his backside.